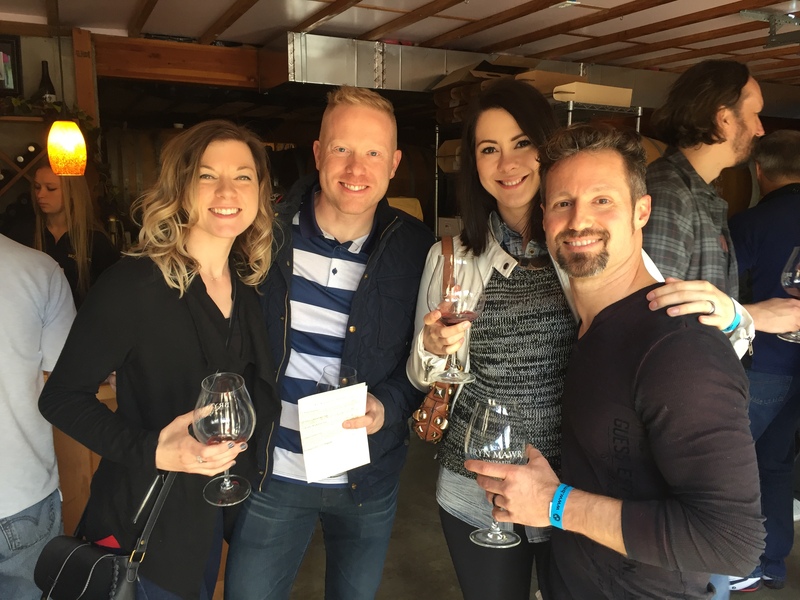 This year’s Wine Country Tour took place on May 6, and started at our favorite winery from last year’s tour, Durant Vineyards at Red Ridge Farm near Dundee. Despite a rainy spring, the day broke into a glorious blue sky with fluffy clouds and mild temps. 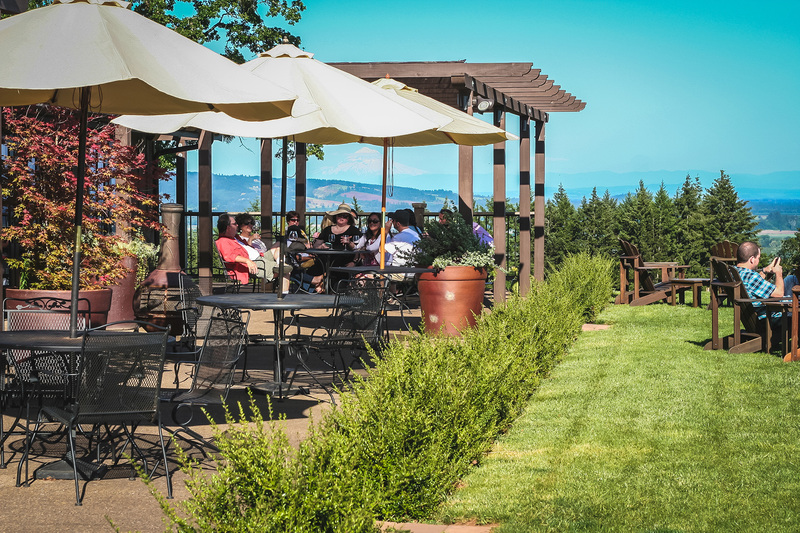 The grounds at Durant overlook the Willamette Valley, and is a relaxing casual atmosphere. It was also busy hosting a farmer’s market and wine club pickup that day, and we had many curious onlookers and question-askers. Self-guide maps and rally directions (especially for Drew, our Chief Wine Taster) were provided, and groups set out for the second destination. Immediately Alex and I noticed something was amiss, as a couple of cars in front of me headed north on Hwy 99 back towards Dundee and Portland, instead of south towards Dayton and McMinnville. We concluded that they must have needed to depart the tour rather early. After a spirited thirty-minute drive south towards Salem through beautiful rolling farmland, we turned west to land at Bryn Mawr Vineyards in the Amity / Eola Hills a.v.a. region. I thought it odd that we were among the first to arrive. It wasn’t long before a huge group came rolling in, and everyone had fun poking at me in jest about printing the wrong turn on the directions. AAAAAGHGHG!! I had looked forward to teasing Drew about wanting rally-style directions instead of using the graphic map I provided last year. Dangit! 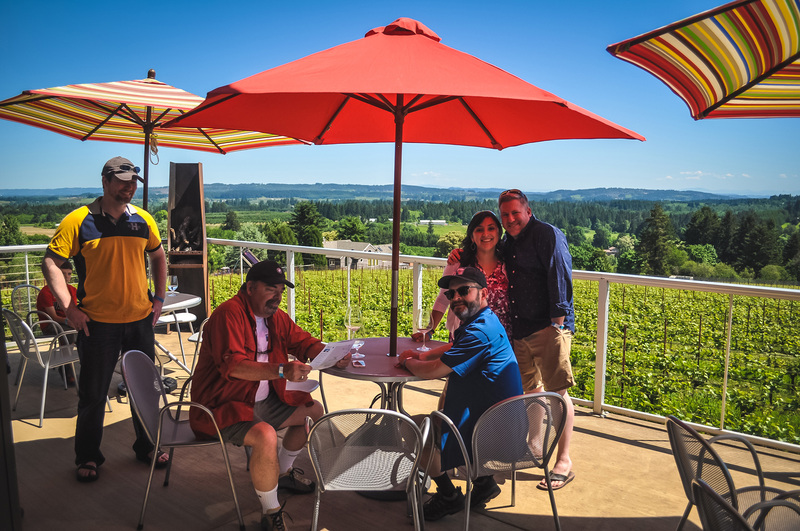 After LOTS of tastings and conversation at Bryn Mawr, hunger for lunch prompted us to move on to our third and final destination, Youngberg Hill Inn and Winery near McMinnville. Another sprited half-hour heading west through more scenic wonders led us up the long private drive in grand procession. 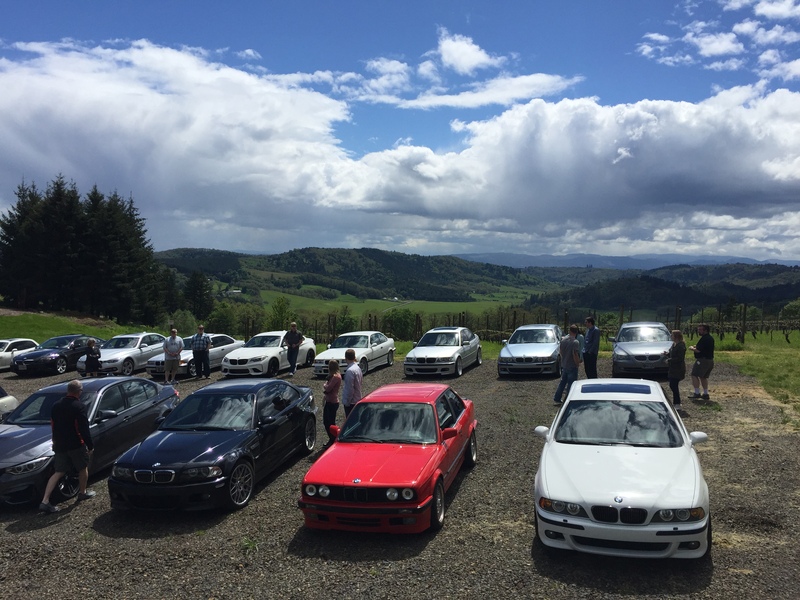 We passed the Inn and numerous “directors” helped all the cars get parked for a photo shoot with the dramatic McMinnville a.v.a mountains in the background. 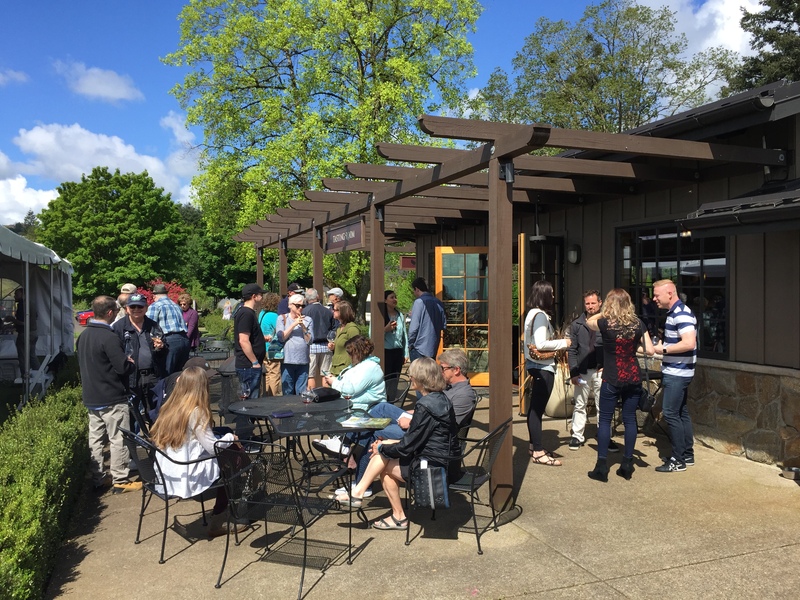 Red Fox Bakery in McMinnville catered our gourmet sandwich picnic inside the brand-new events facility. It’s a large open building wrapped with glass garage doors and huge views. At one end is a tasting bar and buffet area. With enough room for a good-sized car collection it would make the perfect home and showroom for any car nut. We enjoyed our lunch, and assembled on the terrace for a group photo. Then many lingered to finish their wines and conversations as others departed for home. We were pleased that everyone had a good time, and look forward to putting on next year’s Wine Country Tour.